Previous – The previous UOM—for example, the previous year. This – This UOM, which includes all dates and times that fall within the select UOM, even if they occur in the future. To date or up to now – UOM to date, or UOM up to now. The displayed phrase adapts to the UOM you choose. However, in all cases this option filters out data that is not between the beginning of the current UOM and the current moment. Last n – The last specified number of the given UOM, which includes all of this UOM and all of the last n −1 UOM. For example, let's say today is May 10, 2017. You choose to use years as your UOM, and set Last n years to 3. The filtered data includes data for all of 2017, plus all of 2016, and all of 2015. If you have any data for the future dates of the current year (2017 in this example), these records are included in your data set. Top and bottom – A number of date entries ranked by another field. You can show the top or bottom n for the type of date or time UOM you choose, based on values in another field. For example, you can choose to show the top 5 sales days based on revenue. Comparisons are applied inclusive to the date specified. For example, if you apply the filter <date> Before 1/1/16, the records returned include all rows with date values through 1/1/16 23:59:59. You can also choose to include or exclude nulls, or exclusively show rows that contain nulls in this field. If you pass in a null date parameter (one without a default value), it doesn't filter the data until you provide a value. If a column or attribute has no time zone information, then the client query engine sets the default interpretation of that datetime data. For example, suppose that a column contains a timestamp, rather than a timestamptz, and you are in a different time zone than the data's origin. In this case, the engine can render the timestamp differently than you expect. Amazon QuickSight and SPICE both use Universal Coordinated Time (UTC) times. 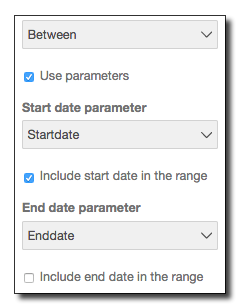 Use the following procedure to create a filter for a date field. Choose Filter on the tool bar. 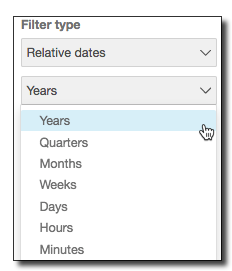 On the Applied filters pane, choose Create one, and then choose a date field to filter on. Choose the new filter to expand it. 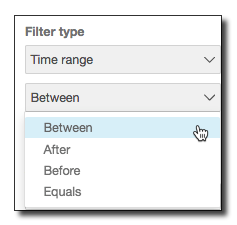 If you are creating a time range filter, choose a comparison type. If you are creating a relative date filter, choose a unit of measure (UOM). If you are creating a top and bottom filter, choose Top or Bottom. Time Range: If you are filtering on a time range, enter date values. 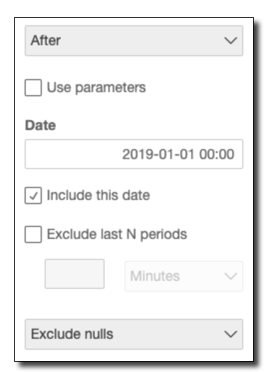 To use Between as a comparison, enter a start and end date, or choose the Start date or End date field to bring up the date picker control and choose dates. You can choose if you want to include either or both the start and end dates in the range. 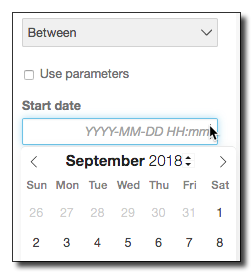 To use Before, After, or Equals comparisons, enter a date or choose the date field to bring up the date picker control and choose a date instead. Relative Dates: If you are filtering on relative dates, choose a unit of measure (UOM). If you choose Last n UOM, specify a number for your range—for example, last 3 years, or last 2 hours. For Show top (or Show bottom), enter the number of top or bottom items you want to show, and choose a unit of time. For By, choose a field to base the ranking on. Optionally, you can add another field as a tie breaker, if the field for By has duplicates. Choose +Tie breaker, and choose another field. To remove a tie breaker, use the delete icon. 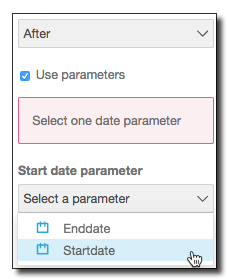 (Optional) If you are filtering by using an existing parameter, instead of specific dates, enable Use parameters, then choose your parameter or parameters from the list. 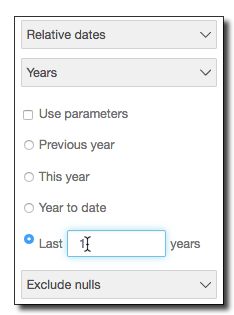 To use Before, After, or Equals comparisons, choose one date parameter. You have the option to include this date in the range. To use Between, enter both the start date and end date parameters separately. You can include the start date, the end date, or both in the range. To use a parameter for Top and bottom, choose an integer parameter for the number of top or bottom items to show. You must create your parameters first, before you can use them in a filter. Usually, you create a parameter, add a control for it, and then add a filter for it. For more information, see Parameters in Amazon QuickSight. (Optional) If you are not using parameters, at the bottom of the filter view, choose how to handle null values in the filtered field. You can choose to include or exclude the values you listed. Alternatively, you can choose to show nulls only. The options for how to handle nulls don't appear for top and bottom filters.